Belgium is one of the most influential countries in the world, with its capital Brussels hosting some of the most important institutions of the EU. The country also has a high standard of living, world-class education and health care, and excellent travel connections by air and land. Thanks to its Schengen membership, a Belgian residence permit lets you and your family travel visa-free in all of Europe. After you residence permit is granted, your immediate family members including your spouse and dependent children can receive residence permits based on the family reunification procedure. 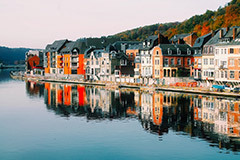 The most important criterion for a successful investment residency application is to show that your business will make a significant contribution to the economy of Belgium by creating local jobs or buying goods or services from local companies. You can incorporate a new Belgian company, or a Belgian subsidiary of an international company. The typical length of the application process is 3-8 months, provided that all required documents are submitted. To show that your business is viable, your application has to include a business plan, as well as proof of operational and business costs for at least the first few months of running your company. The permit is initially granted for one year, and renewed based on your business performance. There is no physical residency requirement once your permit has been granted. You will be eligible to apply for Belgian citizenship after 3 years of residency, and the process usually takes an additional 2 years to be completed. As soon as your residence permit is granted, you and your family will have full visa-free access to all 26 countries of the Schengen zone in Europe. If you acquire Belgian citizenship, you’ll have visa-free access to over 150 countries including the EU, UK, Australia, Canada and the USA. In the first year, you will need to spend an estimated EUR 150,000 for the operating costs of your Belgian business, including expenses such as processing fees, legal costs, property (home, office, workspace etc.) rental and employees. For the 5 years until getting citizenship, you should calculate with an investment of around EUR500,000 in total.